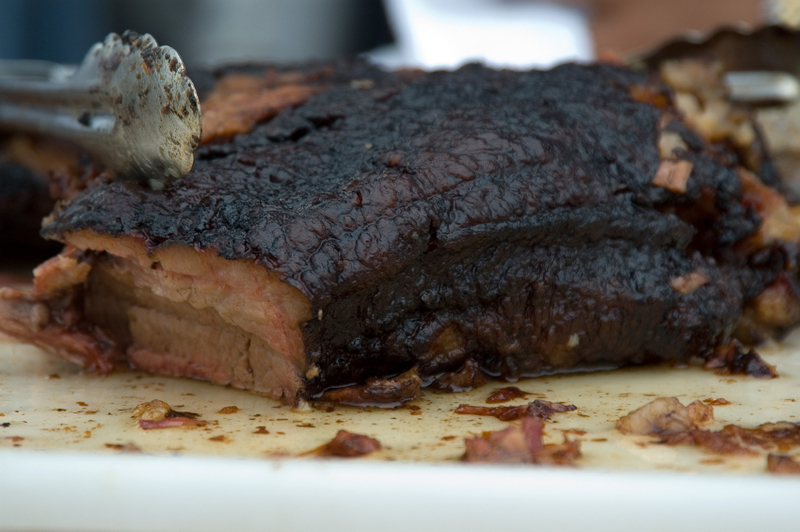 BBQ enthusiasts chase many things when they are engaging in their hobby, but perhaps one of the most elusive and highly prized is the smoke ring. Some of you are no doubt shaking your heads and saying “that’s simple, you just use Tender Quick”…so maybe I should clarify. The smoke ring is something people chase because it is a beautiful addition to meat, and a nice challenge to strive for. Some people will “cheat” to get there (and that’s all Tender Quick is), but many are searching for different methods that don’t involve directly treating the meat. There was a time when a lot of competitive BBQ judging took the smoke ring into account. Now many competitions disallow judgment of this element of the meat. But even with judges at many venues barred from basing any scores off of the appearance of a ring, that doesn’t stop many people from pursuing a nice looking smoke ring during the contests. For many enthusiasts who compete it is still a point of pride for them to deliver a piece of meat that has a beautiful ring. And certainly for people in their own day to day cooking it is a lovely addition to the final product. Before we go any further I should get the general science out of the way. I know it doesn’t really interest everyone, but for those who do get a kick out of knowing how stuff works, here you go. A smoke ring is caused by the interaction of nitric oxide and myoglobin inside the meat. Which is why coating a piece of meat in Tender Quick works to cause an artificial ring: you’re directly adding nitrates to the meat, causing the reaction of myoglobin and nitric oxide to happen by brute force. Use green wood. Many people find that the smoke given off by wood that has been freshly cut and not given time to season will produce a better smoke ring. Soak your wood in water. While similar to green wood (since it has higher moisture content) the act of soaking already seasoned wood does give off a different type of smoke. If you experiment with this, try changing how long you soak the wood for and see if it effects your end result. Keep your meat cool until it is time to go into the smoker. Many people find that starting with the meat a cooler temperature they get a better ring than when they start from room temperature. Related to the last point, some people keep the meat they are going to be smoking in ice water. This won’t freeze the meat, but it will keep it both colder and wetter. You may find that this combination gives you a better ring.